NOVARTIS STRENGTHENS ITS DIGITAL OFFERINGS WITH PEAR THERAPEUTICS PARTNERSHIP: Novartis, the Swiss drugmaker, is partnering with prescription digital therapeutic firm Pear Therapeutics to improve the treatment of schizophrenia and multiple sclerosis (MS). The partnership between the two companies will focus on product development and design, specifically digital products that can be prescribed alongside Novartis’ medication. Novartis will aid in the development of Pear’s Thrive product for patients with schizophrenia. The digital therapeutic provides cognitive behaviour therapy to patients via mobile and desktop applications. This includes real-time interventions targeting positive symptoms of schizophrenia, such as hallucinations and delusions, and also provides support for schizophrenia-related mood disorders. The solution, which can be prescribed alongside drug therapies, has received positive results in three clinical trials. The firms will jointly design a new digital solution to address mental health conditions, such as depression, suffered by MS patients. Most treatments for MS focus on mobility symptoms but don’t address peripheral conditions, such as the depression, anxiety, fatigue, and cognitive impairment, that patients encounter. A combination of drugs and digital therapeutics that address both the physical and mental symptoms is the best way to treat patients, Novartis head of digital therapeutics Joris Van Dam told MobiHealthNews. The partnership will aid Novartis’ move beyond pill-based therapeutics and towards health management. Providers are increasingly turning to digital health services, and Novartis is padding its offerings with digital services to differentiate from the competition and make it more attractive to clients. The drugmaker is one of the most active investors in healthcare technologies, including telemedicine platforms, point-of-care diagnostics, and oncology therapeutics, according to CB Insights. The Novartis and Pear Therapeutics partnership follows a trend that has been a growing within big pharma. Pharmaceutical companies are looking more to outcome-based solutions as the healthcare industry moves to value-based care model. This involves the adoption of digital health technology to increase engagement with patients to improve care and medication adherence. For example, Merck KGaA recently partnered with North American digital therapeutics company Blue Mesa Health to pilot Diabetes Prevention Programs. Merck KGaA was already seen as a leader in diabetic medicine, but this new partnership will allow the firm to offer providers new solutions to stay better connected with patients and improve overall care. The global digital therapeutics market size is expected to grow from $US1.7 billion in 2016 to $US9.4 billion by 2025, according to Grand View Research. HEART APP IMPROVES JOHNS HOPKINS’ PATIENT OUTCOMES: A new cardiology-focused iPhone app is reducing readmission rates for heart attack patients, resulting in massive savings, according to a Johns Hopkins University study. The app, dubbed “Corrie,” helps patients navigate the hospital discharge process by educating them about heart disease. Patients can use the app to keep track of medication regimens and follow-up appointments, as well as receive guidance with lifestyle changes needed after a heart attack. Researchers found that just 3% of the 60 patients using Corrie were readmitted to the hospital within 30 days, compared to the 19% of all heart attack patients at Johns Hopkins. The decline in readmissions represents cost savings of $US262,500 in penalties – Johns Hopkins doesn’t receive Medicare reimbursements for patient readmissions. The app can also sync with Apple Watches to track users’ activity, and with blood pressure monitors via Bluetooth. Corrie is the first cardiology-focused app on the Apple CareKit platform – an iOS developer framework aimed at making it easier for consumers to manage and track their health apps. While the study was small, Corrie is just the latest example of how hospitals and providers can use consumer-facing smartphone apps and mobile devices to not only improve patient outcomes and drive preventative medicine, but also to help lower costs associated with unnecessary ER admissions. AI-FUELLED MEDICAL LOGISTICS PLATFORM RAISES $US5 MILLION: Tagnos raised $US5 million in funding for its AI-powered hospital logistics platform, according to MobiHealthNews. The platform combines data from real-time location systems (RTLS), such as electronic health records and computerised physician order entry (CPOE) systems, to improve the flow of patients within the hospital or clinic. The platform can identify patterns that might indicate a logistical bottleneck and alert staff. Solutions such as Tagnos’ platform are helping to address an increasingly expensive pitfall in hospital and clinical workflows. Poor communication between departments costs the average US hospital around $US1.75 million annually, according to Spyglass Consulting. 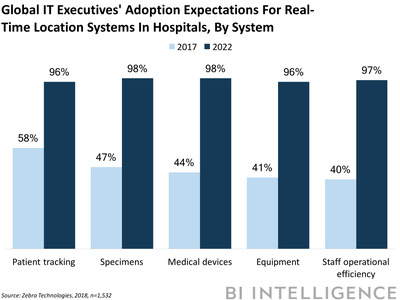 The continued adoption of mobile technology by hospital staff as well as advances in connected technology is giving healthcare organisations the opportunity to address these issues, either through platform solutions, or through the higher usage of healthcare-focused mobile devices. 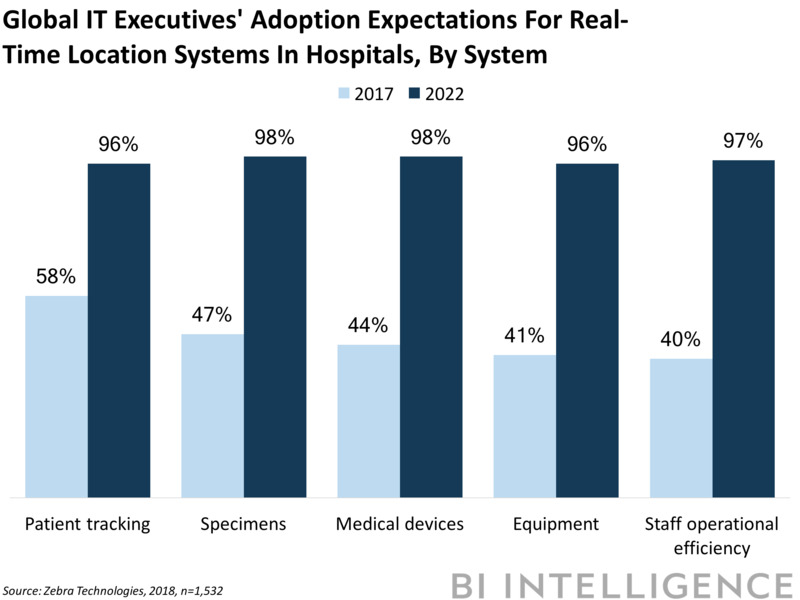 By 2022, 97% of bedside nurses and 98% of physicians expect to be using mobile devices in the hospital setting, according to Zebra Technologies. That’s up from 65% of bedside nurses and 51% of physicians in 2017. HELIX GETS $US200 MILLION IN FUNDING AS IT AIMS TO GROW ITS MARKETPLACE: Helix, the California-based consumer genetics startup, raised $US200 million to expand its DNA marketplace, according to TechCrunch. Helix differentiates itself from most consumer genetic firms because it doesn’t develop actual tests, rather, the firm developed a marketplace for companies to sell their services on. After Helix collects and sequences a user’s DNA sample, it then stores that data so a user can share that data with genetic test companies. Users can pick different products,such as National Geographic’s genetic test, straight from the marketplace without the hassle of having to provide a whole new saliva sample. The marketplace, which currently includes 35 products, is expected to more than double its offerings by the end of 2018, as a result of this latest investment. Helix has reported early success – 20% of its customers who bought one product ended up buying a second. The firm’s likely hoping to capitalise on a significant opportunity – the global direct-to-consumer genetic testing market is projected to grow at a compound annual growth rate of 20%, from $US117 million in 2017 $ 611 million by 2026,according to Credence Research. Travis Kalanick, the co-founder and former CEO of Uber, is joining the board of Kareo, a medical software company the provides independent medical practices with cloud computing products and services for electronic health records, practice management and bill paying, Axios reports. Kalanick was an angel investor in Kareo, which has surpassed $US70 million in annual revenue.